We offer one-on-one on stream casting instructions Rick Nyles, Brian Shumaker, Dave Rothrock or Taylor Helbig. Pricing is based on location and time required. We will have several Casting Clinics throughout the year. These clinics are held at a low cost to cover food provided. 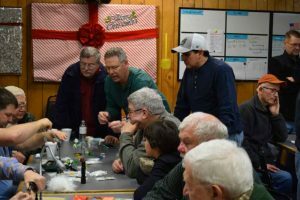 We offer fly tying classes and one-on-one programs teaching nymphs, drys (CDC and UP DN TROUT), stoneflies and streamers. Price is based on location and hours. Come join George Daniel, Dave Allbaugh, Dave Rothrock and Rick Nyles to learn all aspects of fly fishing for trout. You will not find a more experienced group, in their discipline, putting on a class. Limited is 4 students. Cost is $ 950.00 per student and is all inclusive (teaching, lodging and food). Bring your license and gear. Lodging is on Big Fishing Creek in Logan Mills, PA. Arrive after 4 pm and get settled in, fish on the property, Dinner will be served at 7:00 pm and we can do some fly tying. Breakfast at 7:00 am. 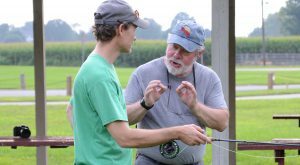 Class with Dave Allbaugh on wet fly fishing 8:00 am until 9:00 am. Class with Rick Nyles 9:00 am until 10:00 am. We will then head to one of the local creeks (Penns, Spring, Big Fishing). Two clients will go with Dave and two clients will go with Rick. We will all get back together for lunch and the clients will switch over to the other guide. Evening we will do some fly tying. Breakfast at 7:00 am. Class room with George 8:00 am until 10:00 am. George will then do a clinic on the property, working with each client. Lunch will be served and then we will head out to Big Fishing Creek to catch fish. Rick and Dave will assist on the stream while George is working with each client. Evening we will do some fly tying and or casting instructions. Breakfast will be served at 7:00 am. This will be a hot breakfast. After breakfast Dave Rothrock will be holding a casting clinic from 8:30 am until 10:00 am. All meals and lodging included. Meals will be seafood, steak and BBQ chicken. Lunch will be sandwiches. Breakfast Friday and Saturday will be bagels, muffins, oatmeal, fruit and coffee. Hot breakfast on Sunday, pancakes and sausage or french toast. Walk and Wade require a 50% deposit when you book a date. It is payable within two weeks via check or credit card (PayPal). 50% balance is due two (2) weeks before the scheduled date. Cancellations before two (2) weeks can be rescheduled or at our discretion, we will provide a full refund. Cancellations within the two (2) weeks before the scheduled trip, you will forfeit your deposit or, at our discretion, we will reschedule your trip or offer a refund. 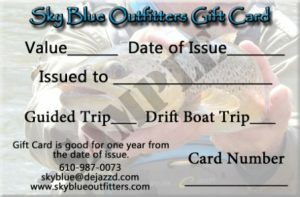 If we fill your spot with another client(s) you will receive a full refund. Please remember that we understand that special circumstances come up in our lives. Please work with us and we will work with you. Overnight Packaged trips require a 50% deposit when you book a date. It is payable within two weeks via check or credit card (PayPal). 50% balance is due 60 days before the scheduled date. Cancellations before 60 days can be rescheduled or at our discretion, we will provide a full refund. Cancellations within the 60 days before the scheduled trip, you will forfeit your deposit or, at our discretion, we will reschedule your trip or offer a refund. If we fill your spot with another client(s) you will receive a full refund. Please remember that we understand that special circumstances come up in our lives. Please work with us and we will work with you. Weather Cancellations are at our discretion. Most days poor weather means great fishing.